As Yanga Gwe steps over the edge of one of Cape Town’s tallest skyscrapers his mind does not dwell on the street a nauseating 100-odd metres below. This daily leap of faith that would give most people nightmares has long since stopped making his heart race. 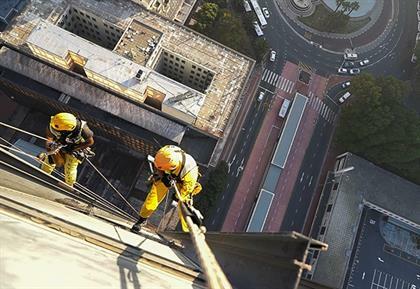 The 27-year-old has worked as a professional rope technician since 2015 and routinely dangles from the city’s high-rise office blocks to clean windows and carry out repairs or refurbishment work. But, although he doesn’t suffer from vertigo, he recalls how he planned to face any potential fears head-on when he first qualified for the job. He phoned his office and asked to be sent to the 42-storey Portside building to "shake the scare away". "I had to get the hang of working on a tall building first and I had to get the hang of working fast," he recalls. "Now it's nothing, really – it's an everyday thing. We all get used to it," he says. Though he may sound flippant about the fear factor, Gwe knows just how easily things can go wrong. This is why banter and jokes are quickly wrapped up as his team prepares to descend from the top of the 36-storey ABSA Centre in the city centre just after sunrise. "Honestly, we check our ropes regularly and our harnesses, simply because you don't know who was using it before you." Focusing on the necessary risk assessments and safety checks is what gives Gwe and his team members the confidence to their jobs without being paralysed by fear. Gwe says it was the lucrative pay that drew him to "roping", but many others hoping to earn more fall at the first hurdle. "Everyone wants to do it, they say it's fun, but most of them, once they go for the course, or on a very high building, they get scared and say they'd never do it," Gwe says. SkySite Managing Director Simon Hareb says there's a lot more to the job than being able to hang on a rope. "You need to be smart enough to learn multiple skills that will allow you to carry out a variety of tasks on the end of a rope," he says. Before allowing any new technicians on the ropes, the company puts them through a practical examination to test their reactions to stressful scenarios, and where the position requires, rescue and rigging scenarios are tested. Rope technicians also need to be physically fit, due to the demands of the job. "The technician's mental state is also very important and needs to be considered. Clarity of mind is very important," he adds. Though the company does rigourous risk assessments and plans for any new buildings they work on, there is one factor they cannot control – the weather. Gwe admits it is the one thing that frightens even the bravest ropers. "The worst part of the job is when the wind picks up and you're on the ropes. That's something I don't want – any roper doesn't want that – because the wind makes you lose control first and it makes you spin around… The ropes tangle up, you can't come down…"
"If it blows then we call it a day, we don't go on the ropes." Gwe says, risks aside, the job can be a lot of fun. "For me, I like hanging more than working on the ground or doing anything… Every morning when I wake up I just can't wait to get on the ropes…"
"I always sum it up and say in every job it's risky – whether you're a welder, whether you're a bricklayer, whether you're a journalist… but as long as I know what I'm doing, I know I'm safe."